The Spraytect Self-Defense iPhone Case helps you protect your iPhone - and yourself - as you go through your life. 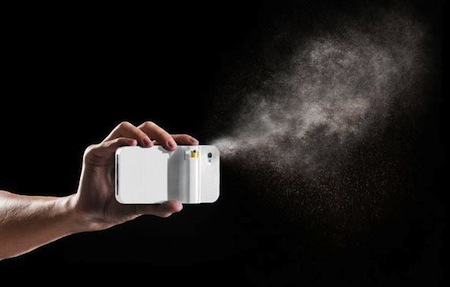 Apple tech paired with military-grade pepper spray - what's not to like? Spraytect™ is a protective case for a smartphone with a removable pepper spray cartridge attached to the back of the phone case. It’s convenient and accessible so you’re protected anywhere and anytime. After an exhaustive search for personal protection devices for his college bound daughter, Scott McPherson was disheartened. There were no easy-to-carry or socially acceptable options available in the marketplace. There were many pepper sprays and other various safety devices for her backpack, but none that were easily accessible. Then the dots were connected. Most co-eds don’t go anywhere without their smartphone so the optimal solution was to combine her phone and a safety device. Fans of Frederik Pohl recall that his amazing Joymaker, which anticipates practically every feature of modern-day smartphones, also was able to spray chemicals. "Cut that out!" Forrester was breathing hard. Abruptly, the joymaker in his hand hissed and sprayed him with something that felt damp for a second, then dissipated. Forrester felt himself relaxing. He appreciated the tranquilizing spray, without quite liking the idea of a having a machine prescribe and spray it. From Spraytect via The Fancy (see also the Spraytect video).